I finally got around to making a motorized gear box. It's a planetary gear set driven by a stepper motor. An Arduino with motor driver board controls and powers the stepper to make various different sounds. No recordings yet. Here are some photos. 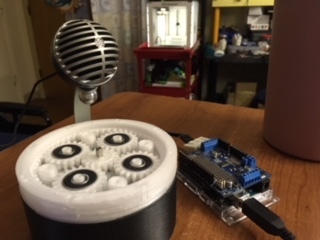 Please see https://www.thingiverse.com/thing:2785857 for printer files and more detailed description of the build.